Last night turned into a late night when I ventured up to Ferndale’s Ringwald Theatre for their closing performance of Angels in America: Part II. I had seen Philadelphia’s Wilma Theater take on Part I in early summer, 2012, and am not sure why I didn’t go back when they also ran Part II that fall in a similar arrangement to what the Ringwald has done this year. 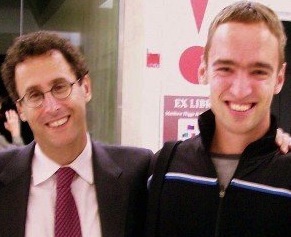 I also briefly met Tony Kushner himself almost exactly seven years ago (picture below) so the timing felt right to re-visit his most well – known work, especially since the play(s) have continued to be held in wide acclaim, but don’t seem to be performed too often. This production deserved acclaim for mounting a large – scale play in the Ringwald’s intimate space, and the company seems to enjoy challenging itself in that way. I found it to be an inconsistent performance, with some aspects, such as Dennis Kleinsmith’s intense portrayal of closeted dying lawyer Roy Cohn, standing out amongst the ensemble work, while other design and acting choices, such as having a too consistent chorale underscore to many scenes, were problematic to my eye. The production received local attention including, but not limited to, a review in the Detroit Free Press. In spite of my mixed impressions, the Ringwald’s commitment to Kushner’s material is notable, and any honors the company receives for their staging of both parts of the Angels epic will surely be deserved. I hope the production team also feels a sense of accomplishment today as they reflect on a journey of many months and experiences. Posted on September 30, 2014, in Theatre and tagged angels in america, ferndale, philadelphia, san francisco, the ringwald theater, theatre memories, tony kushner, wilma theater. Bookmark the permalink. Leave a comment.